I can't believe it has been more than half a year since I have blogged! Thank you for those who came by and left me a comment to say hello and ask after me. Life has been really hectic since I became a stay at home mum and I haven't been baking much which explains the lack of postings too. I really miss sitting in front of the computer blogging away and checking out all your yummy postings. I hope to be back to baking more soon. I don't cook many fanciful meals these days and everything is as simple as can be since I am almost always rushed for time. 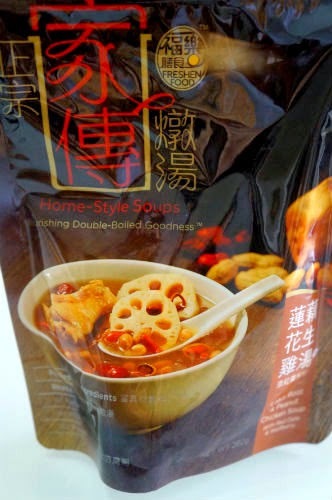 A few months back, a good friend (and ex-colleague) of mine, Pamela, launched her ready-to-drink traditional double boiled soups in a few flavours: Radish & Carrot Chicken Soup, Lotus Root & Peanut Chicken Soup as well as Carrot & Potato Chicken Soup. The soup broth is prepared from chicken bone, dried scallop and octopus which gives the stock a wonderfully rich flavour, just like what we brew at home. These recipes were from Pamela's grandmother which explains the soups' traditional flavours. I was blessed with packs of these delicious soups which my children enjoy very much. I would cook some macaroni, topped up with one pack of soup and it becomes an instant, quick to cook and nutritious lunch. 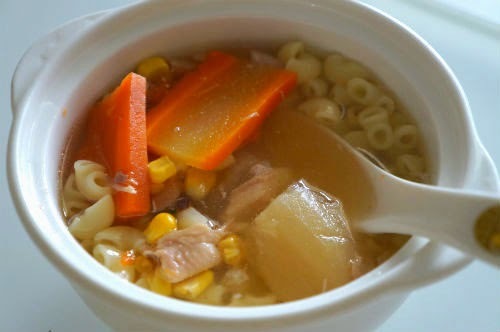 Here's my kid's lunch - macaroni in the Radish & Carrot Chicken Soup - chock full of ingredients. The Lotus Root & Peanut Chicken Soup is my children's favourite. These soups are currently retailing in Singapore supermarkets (NTUC Fairprice). I'm going to sign off now. 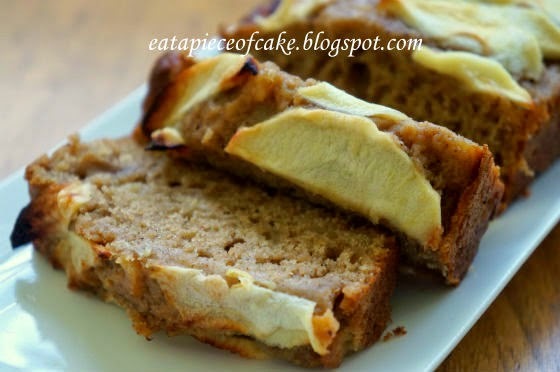 I hope to be visiting a few of your blogs soon and be back to baking again. Till then, take care! For this edition of the Home Bakers hosted by Joyce of Kitchen Flavours, the chosen cake is the Chocolate Nugget-Orange Flax Cake, picked by me. 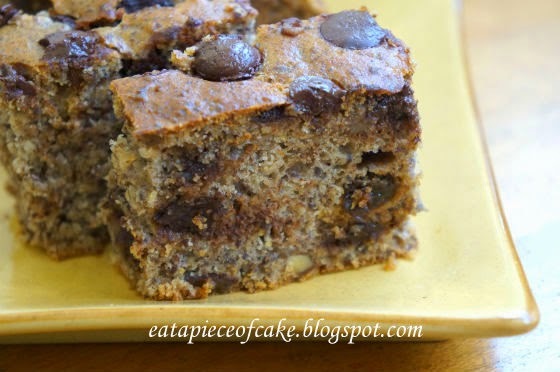 I have never baked a cake with flaxseed meal (I usually bake it in bread) and because I love orange and chocolate which are both ingredients for this cake, this was my cake of choice. 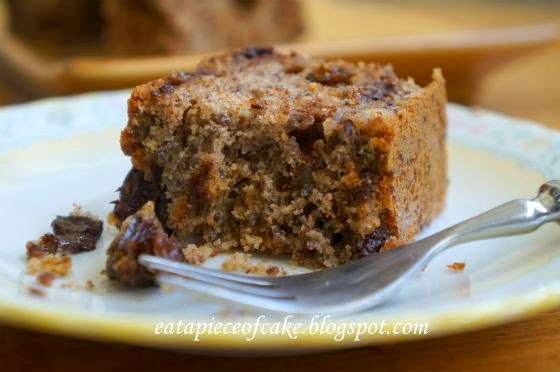 This cake is definitely a healthier choice as only some oil is used and the cake is largely moistened by yoghurt and honey. 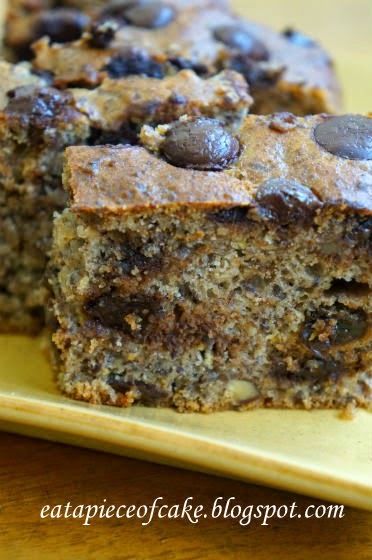 The use of wholemeal flour and flaxseed meal adds a good amount of fiber to this cake as well. The combination of chocolate, orange and nuts add a flavourful punch. My family enjoyed this cake very much. Preheat oven to 350 degrees F (175 degrees C). Butter and flour a 9 by 13 inch baking pan. In a large bowl, combine flours, baking soda, baking powder, salt and granulated sugar. Stir to blend. In a medium bowl, beat the eggs and stir in the oil, buttermilk or yoghurt, honey, orange juice concentrate and orange zest. Add to dry ingredients and mix until just blended. Mix in the flax cereal and currants or raisins. Turn into the prepared pan and smooth the top. Toss the nuts and chocolate chips together and sprinkle evenly over the top. Bake for 25 to 35 mins or until the cake is golden brown and a cake tester inserted in the center comes out clean. Let cool in the pan on a wire rack. Serve warm, cut into squares or strips. 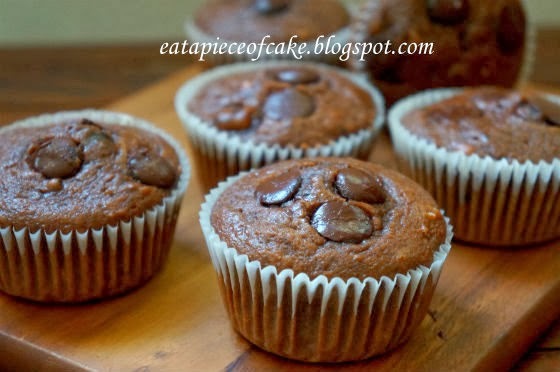 Good chocolate muffin recipes are not easy to come by. I've tried quite a few. They are either too dry, or not chocolatey enough or too fattening. Here's one that is just about right. Rich and moist but healthier if you use low fat plain yoghurt. 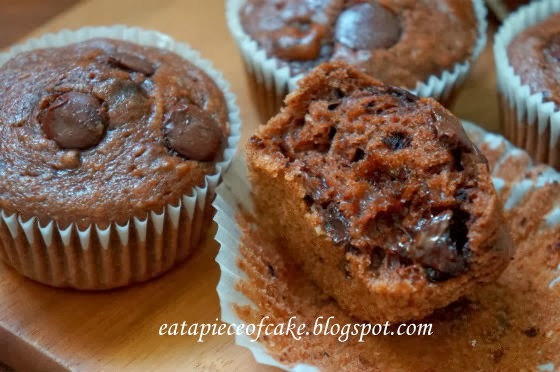 The combination of a good quality chocolate powder and chocolate chips which oozes when you bite into it is what makes this muffin stand out. 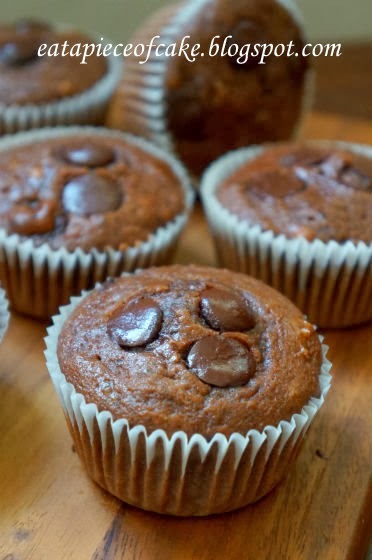 This is definitely one of my favourite chocolate muffin recipes. Whisk egg, yogurt, milk, and vegetable oil in another bowl until smooth; pour into chocolate mixture and stir until batter is just blended. Quick and easy pasta dishes are a mum's life saver for days when you need to whip up an almost instant one-dish meal with minimal ingredients. 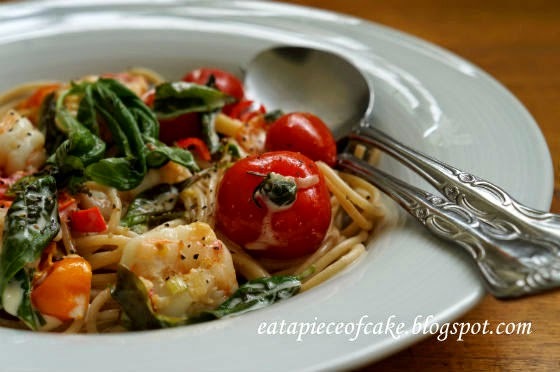 Gordan Ramsey's Spaghetti with Prawns in Creamy Tomato Sauce certainly fits the bill for such a dish. 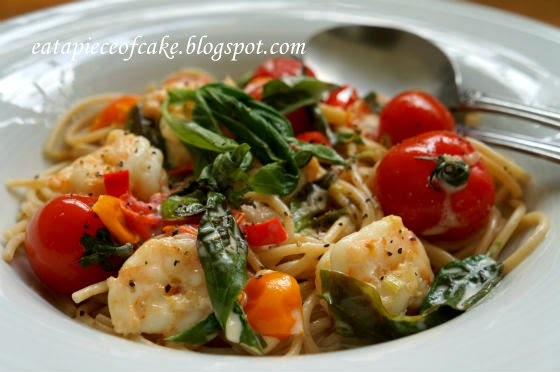 Prawns and softened cherry tomatoes are mixed with pasta in a creamy sauce infused with aromatic basil. There is a slight hint of spiciness from the chilli but not enough to really make it too spicy for the kids to enjoy. I prefer more sauce, so I doubled the amount of cream added. In fact I don't think the 100ml of cream recommended in the recipe is enough to coat the 500g of pasta. This is a must-try fuss free dinner. Put the cherry tomatoes, spring onion, chilli, garlic and olive oil in a heavy-based pan and cook over a medium heat until soft but not coloured. Season with pepper and cook until soft. Add the spaghetti to a large pan of boiling salted water with the olive oil and cook until al dente. Meanwhile add the prawns to the sauce and stir in the cream and chopped basil. Warm through gently for a couple of minutes. Drain the pasta and toss with the pasta sauce. Divide between warm plates, Serve immediately. This is for Cook Like A Star hosted by Zoe of Bake for Happy Kids, Baby Sumo of Eat Your Heart Out and Mich of Piece of Cake. There's nothing more delicious than fresh prawns cooked simply like in this Gordan Ramsay recipe. Tiger prawns are really costly locally so I only bought six of them. 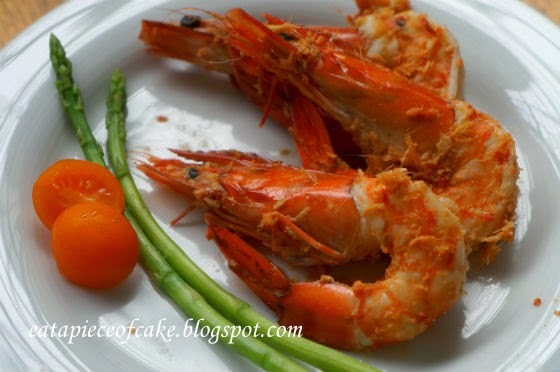 The prawns are marinated in flavourful ingredients for half a day and that really made it that especially delicious. 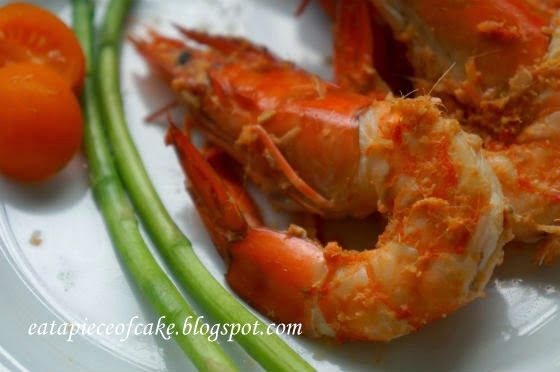 Sweet juicy prawns imbued with aromatic lemongrass and garlic and the spiciness of chilli! Though Gordan Ramsay recommended that these are to be dipped into mayo or salsa, I think that's not necessary as that would cover the flavours of the marinade. I'd eat the prawns as it is! Put the tiger prawns in a shallow dish. Pound the garlic, chillies, lemongrass and ginger together using a pestle and mortar, gradually adding the olive oil until you have a rough paste (or whiz briefly in the blender). Season with salt and pepper. 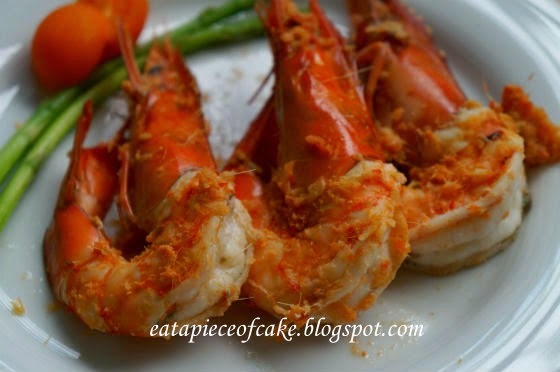 Baste the prawns with the spice paste and leave to marinate in a cool place for 2-3 hours. Cook the marinated prawns on the hot barbecue for 4-6 minutes, turning, until they turn pink and feel slightly firm to the touch – don’t overcook. Serve at once, with a flavoured vinaigrette, soured cream or tomato salsa. 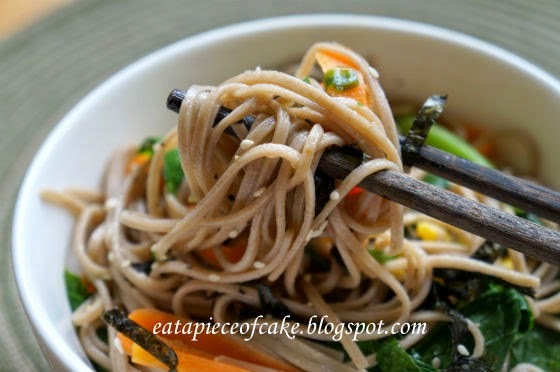 Soba is one of my family's favourite noodles and I usually make it when I am pressed for time and cannot cook a full Chinese meal with dishes and soup. 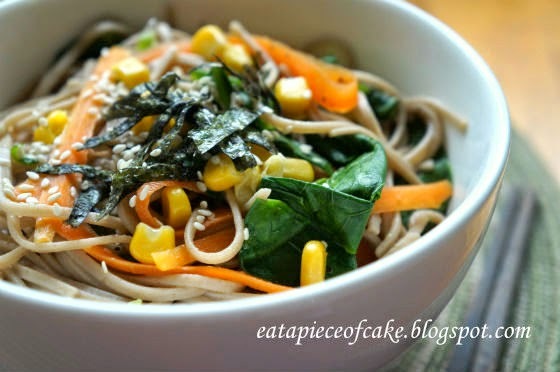 This flavourful and easy to do Soba Salad from Gordan Ramsay was our dinner on a Sunday evening when we came home fairly late and I had to whip up something real quick. 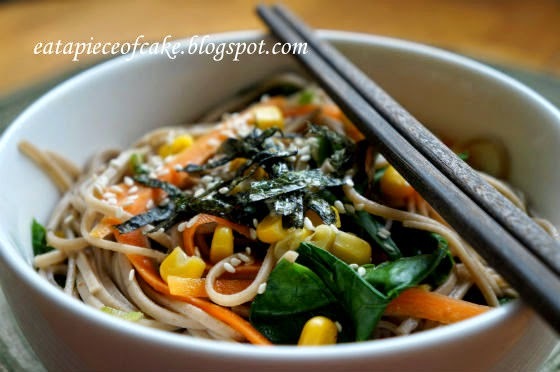 The mix of sauce gave the noodles and vegetables a lovely refreshing, yet light, flavours. I served this together with some sushi for a light and healthy Japanese dinner. Cook the soba noodles according to the packet instructions. When almost cooked, add the kale, sugarsnaps and carrots to the pan to blanch. Drain once the noodles are tender. Add all the remaining ingredients to the noodle mixture, season with a little salt and pepper, stir well and serve. Many of us would probably remember Gordan Ramsey for his visit to Singapore last year where he pitted his skills against a few famous hawkers, dishing out delicious local food such as Singapore Chilli Crabs and Laksa. 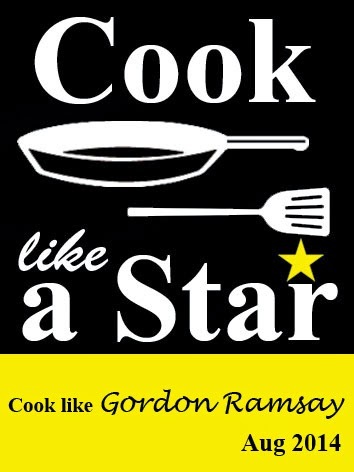 For Cook Like A Star the month of August, we'll be cooking along with Ramsey - a Scottish chef with well known restaurants all over the world. Do come and join us by posting your link to the linky below from August 1st. 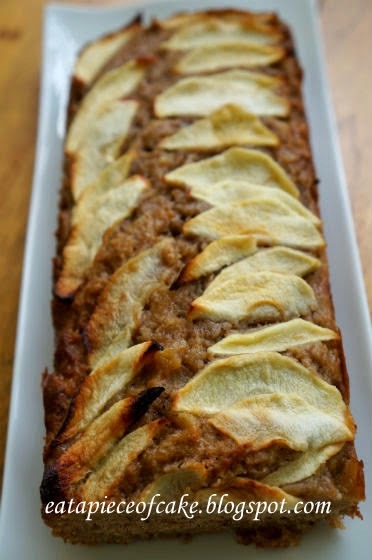 I picked this Spiced Apple Cake as my first Ramsey dish to try and I wasn't disappointed. 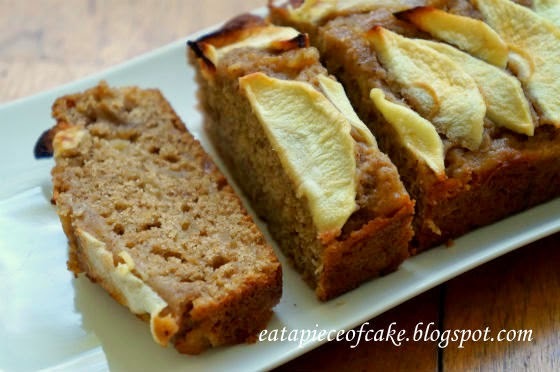 Deliciously dense and moist, the sweetness of the apple puree is apparent in each bite. The best part is that its low in sugar and naturally sweetened by the apple purees and low in oil. It's definitely a lovely healthier treat for kids. Peel, core and slice the cooking apples. Place in a wide pan with the sugar and butter. Cook over a high heat for 10–15 minutes until the apples have broken down to a pulp and any excess water has cooked off. Transfer to a bowl and cool completely. You should have about 475g* purée. Heat the oven to 170°C/Gas 3. Line and lightly grease a 23cm cake tin with a removable base. Peel, core and finely slice the eating apple, using a mandolin or sharp knife. Place in a bowl and pour over most of the lemon juice and a splash of water; set aside. In a large bowl, mix together the wholemeal flour, baking powder, bicarbonate of soda, salt, sugar and ground spices. Make a well in the centre and add the egg, olive oil and apple purée. Fold into the dry ingredients until just combined. Transfer the mixture to the prepared cake tin and gently level the top with a spatula. Bake the cake for 30 minutes until it feels just firm to the touch in the centre. Working quickly, overlap the sliced apples in concentric circles on top, leaving a margin around the edge. Brush the slices with a little lemon juice and return to the oven for a further 30–35 minutes until a skewer inserted into the centre comes out clean. Let the cake cool slightly before unmoulding onto a wire rack. Warm the apricot jam with the water, stirring until smooth. Brush over the top of the cake to glaze. Serve warm. Note: *I didn't manage to get the 475g of apple puree, so I topped up with low fat yoghurt to make 475g. Welcome to Piece of Cake! 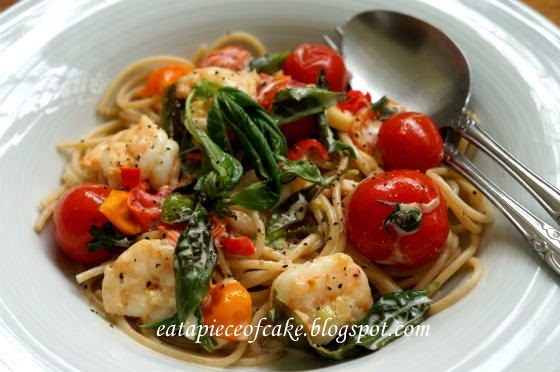 Thank you for visiting my blog which details my culinary adventures from my kitchen in Singapore. I'd love to hear from you at eat.a.pieceofcake@gmail.com. Copyrighted by Mich @ Piece of Cake. Watermark theme. Powered by Blogger.